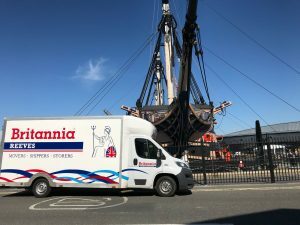 Petersfield-based Britannia Reeves took on a monster move recently when they were asked to help the Portsmouth Historic Dockyard relocate a number of priceless artefacts. This included a cannon, recovered from a shipwreck which had been lying 246 feet beneath a busy shipping lane for the last 260 years and was discovered just 10 years ago. Cast around 1740, the 42lb bronze cannon graced the gun deck of the original HMS Victory which was sunk during a storm off the coast of Plymouth in 1744 with the loss of over 1,000 crew. 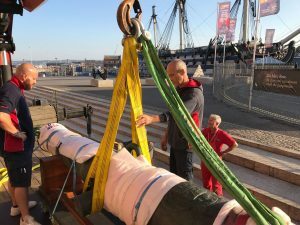 The cannon will now go on display at the National Museum of the Royal Navy in Portsmouth. Professor Dominic Tweddle, NMRN Director General, said: “The 42-pounder is an exceptional example of Georgian firepower and it adds to the mythology surrounding HMS Victory 1744 as an incomparable warship, one of the most technologically advanced of her time. Andrew Shotbolt – Managing Director of Britannia Reeves – commented “This was a huge job with a huge responsibility to ensure the move went according to plan. It is possibly the proudest we’ve ever been, moving an item of such historical significance without a hitch and with the knowledge that so many historians had trust in our company to move all of the artefacts seamlessly’.